Marc Lichte, head of design at Audi, presents the Q8 in Shenzhen, China, on Tuesday. 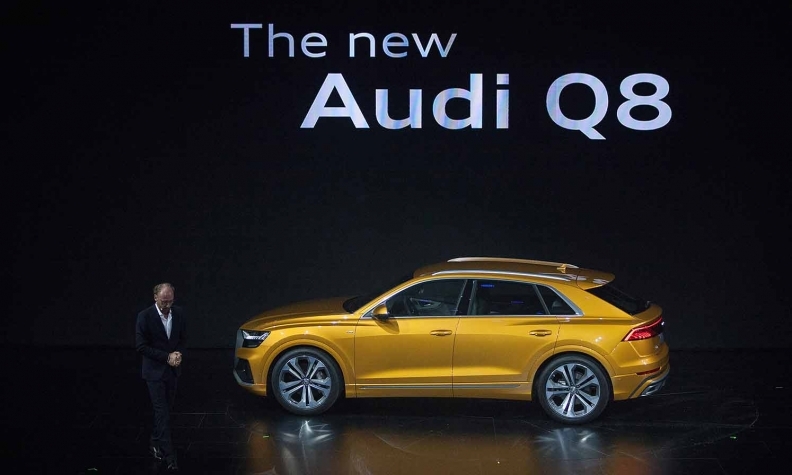 Audi introduced the production version of its new crossover, the Q8, on Tuesday during a brand summit in Shenzen, China, featuring a suite of new technology features, with plans for an autonomous parking system. Audi expects to begin Q8 sales in Europe by the third quarter and in North America later this year. The Q8 has a wider, shorter stance than the three-row Q7, giving it sportier exterior styling while keeping the three-row seating. Inside, the folding rear seats adjust longitudinally, providing options to adjust legroom. With the seatbacks folded down, the luggage compartment holds up to 1,755 liters (62.0 cubic feet). The all-wheel-drive system comes standard with damper control to smooth out ride and handling but offers an optional adaptive air suspension system that can be adjusted for greater comfort or sportier feel. The Q8 offers 10 inches of ground clearance, but the air suspension can alter the ride height by as much as 90mm (3.5 inches), depending on the driver's preference. The SUV will offer fuel-saving mild hybrid technology with a 48-volt primary electrical system. Optional on the Q8 is all-wheel steering, which turns the rear wheels up to 5 degrees counter to the front wheels at low speeds to increase agility and in the direction of the front wheels at high speeds to provide better stability during a turn. Inside the cabin, nearly all functions are operated by two large screens -- a 10.1-inch display above controls infotainment and navigation while an 8.6-inch display below controls heating, air conditioning and other convenience features. The displays feature an integrated haptic response, giving an audible click when a finger activates a function. Designers also incorporated what Audi calls natural language voice controls, allowing drivers to speak commands naturally instead of choosing from a list of preprogrammed commands. Along with a suite of safety and communications systems, Audi says, the Q8 later will offer a feature called garage pilot early next year. It will allow the driver to be outside the Q8 as it autonomously enters or exits a parking space. The feature requires activation through the myAudi app on an Android smartphone. To perform this and other driver-assist functions, the Q8 receives data from up to five on-board radar sensors, six cameras, 12 ultrasound sensors and a laser scanner.